Hey all you Hallmarkies out there! Are you ready for the first “Fall Harvest 2018” movie, Truly, Madly, Sweetly?” I know I am. Hello, my name is Debbie and I am a Hallmark Channel movie junkie..
Isn’t life a little crazy right now? Wouldn’t you enjoy a relaxing escape for a couple hours every Saturday night? Who wouldn’t, right? A cutesy, silly, fun, harmless, family Hallmark movie is the way to go. The extreme popularity of Hallmark movies has been written about endlessly, so there must be something to it. Viewers of all ages love Hallmark movies. And I have a true story about that. The following scenario took place recently on a New York City subway. My daughter Kristina was on the subway sitting across from a big, burly guy wearing a baseball cap, shorts, and tee-shirt, and looking like a nose tackle for the Giants or Jets. Talking completely serious to his buddy next to him with his thick Brooklyn accent, he starts explaining something to him. “Hey, here’s the deal,” he says. “Man, all you need is a Saturday night, a bucket of popcorn, and a Hallmark movie. You eat your popcorn and nobody dies!” It took everything Kristina had not to burst out laughing! 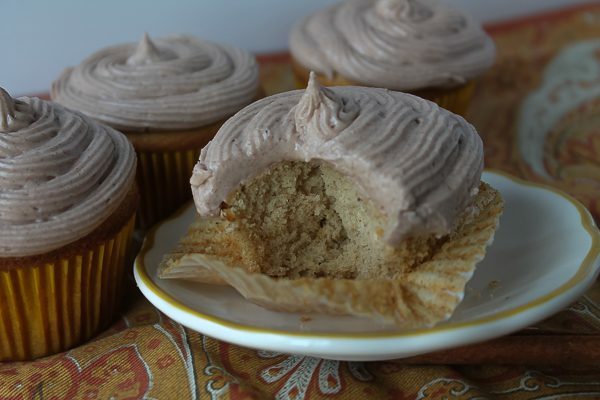 The buttermilk and brown sugar cupcakes have aromatic spices of cinnamon, nutmeg, allspice, and cloves. The buttery frosting has more cinnamon and a little vanilla. Perfect for snacking while watching the movie, which is about a woman who has the cupcake truck and something about a bakery she inherits. We’ll have to watch and find out the details! Tune in Saturday night, September 22nd for the premiere of Truly, Madly, Sweetly at 8:00 CST/9:00 EST starring Dylan Neal and Nikki DeLoach. Check back on my blog every Friday for the latest Fall Harvest movie and a new recipe. After Fall Harvest will be “Countdown to Christmas” movies starting late October! Heat oven to 350 degrees. Line standard size cupcake pans with liners to make 24 cupcakes. Set aside. For cake: Sift together flour, baking powder, soda, salt, and spices into a bowl; set aside. In bowl of electric mixer cream together butter and brown sugar until light and fluffy. Add eggs, one at a time, beating well after each addition. Stir in flour mixture, alternating with buttermilk. Stir in vanilla. Divide batter into cupcake liners in pans. Bake for about 14 minutes or until a toothpick inserted into center comes out clean. Remove from oven and cool on wire rack about 5 minutes, then turn out cupcakes from pan and cool completely before frosting. For Frosting: Sift powdered sugar and cinnamon into bowl; set aside. In bowl of electric mixer, beat together melted butter and ½ cup of the sugar mixture. Beat in egg white and salt. Add remaining sugar mixture, milk, and vanilla. Beat until of spreading consistency. Frost cupcakes. Makes 2 dozen cupcakes. Note: This is enough frosting to spread on cupcakes, but if you like a lot of frosting and want to use a pastry bag to make large, high swirls, the frosting should be doubled. I’m Kim, and I am a Hallmark movie junkie, too!! And I love spice cake!! 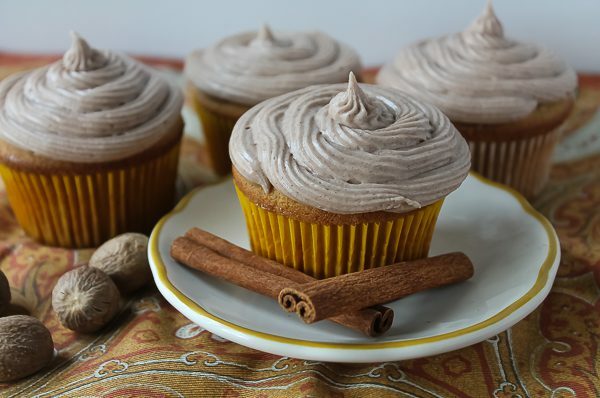 And your spice cupcake recipe looks divine. I am planning on visiting my daughter in college next month and taking a variety of cupcakes to her college house of 13 ladies, with multiple friends always visiting, and I will definitely add your recipe to the list. Thanks for sharing your ‘sweet’ blog! I hope you, and Lydia and her friends will like the cupcakes! You are such a good mom! Someday we must sit down and watch Hallmark movies together. I’m Madonna. Please add me to the list of Hallmark movies junkies (but you already knew that). 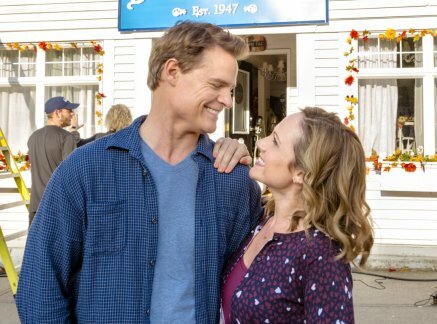 I also confess that I have a big crush on Dylan Neal and am so unhappy that there will be no more Gourmet Detective movies. I’m looking forward to my Dylan/foodie fix tonight. Your spice cupcakes look delicious. I might have to try that recipe. Two of a kind! I haven’t checked Twitter for a few days. I need to see that tweet. In other culinary news, I’ll be in New Orleans next week (one of my cousins is getting married). You know what that means. Have a great time in NOLA! First of all, I adore the Hallmark channels…. but I’m more of a Hallmark Movies and Mysteries person. Murder She Baked series is my favorite – duh. 🙂 Secondly, those cupcakes look fabulous! 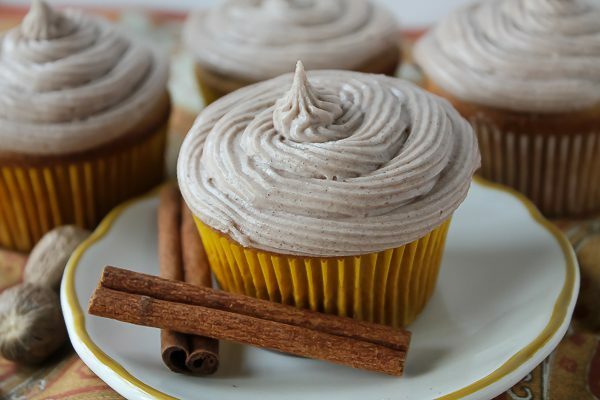 You’re speaking my language with spice cupcake and cinnamon frosting, truly…. are they one of your recipes? Many hugs. Hi Dana- I like the Movies and Mysteries too, including the Murder She Baked series. I am going to miss the Gourmet Detective. Did you like that series? The recipe is one I received from a neighbor many years ago. It’s one of my husband’s favorites. Hi Cynthia- I love how you noticed the food so closely on the show! I do the same thing. Hallmark has great chefs and food stylists on their staff. I remember those pinwheel cookies but I’ll go back to the movie and take a closer look at them. At first they reminded me of the pinwheel-type Scandinavian cookies shaped more like stars and not a sliced pinwheel, but they usually have a jam or prune filling. I’ll get back to you if I find something similar. I wonder if Hallmark keeps tab of all their recipes? Hallmark should publish cookbook of recipes from their movies. I wonder if they have and we haven’t discovered it yet. If they haven’t, they should! I know there was a Cedar Cove cookbook because I wrote about it when that series was airing, but it was a series and not a movie. Maybe someone reading this will know. Thanks so much for the cupcake recipe. I’m just watching the movie now & also wondered about the chocolate Manchester cookies —— I’ve never heard of them before and have yet to find them anywhere online. Did you ever happen to find out what they are and their recipe? They do look like VERY large pinwheel cookies. Now I’m intrigued to find out the recipe. Hi Irene- I’m still looking for the Manchester cookie recipe. Someone else also requested it here. I’d love to have it too, so the search will continue! I too would love the Manchester cookie recipe. My son wants me to made them for his school bake sale. Karen, you are now the third person who is seeking this recipe! I will let all three of you know if I find it. Still looking! I tried google for a chocolate Manchester cookie recipe. Chocolate chip cookies came up, a Manchester tart (Robert Irvine/food network)—apparently some type of sponge cake deal, and lots of places to buy chocolates or restaurants. Maybe hallmark made them up? Or maybe chocolate chip cookies are called Manchester cookies in other than the west coast? I googled right after the show and got just about the same as you did! The cookies they called Manchester were like pinwheel cookies but no hint of what was in the center. My guess would be some kind of jam, or maybe chocolate? I also couldn’t figure out from the brief view of them in the movie, if it was a cookie dough or puff pastry pinwheel. And as you say, maybe someone who does the food at Hallmark made up the name, or it was a favorite family cookie of the cook and Manchester is a last name or a place? Who knows? I would love to hear what others think about this, and then maybe between us, we can make up our own version! I too am looking for the Manchester cookie recepie. Can I please get a copy. This reminds me of a cookie my mom made. She is no longer here and would love the recepie..
Hi Sharon- Other people are looking for that recipe too, but so far no one has posted. If anyone has it, please let us know! I couldn’t find it by that name either. Also interested in the Manchester pinwheel recipe please!! Me too, Leslie! I’m at the conclusion that Hallmark needs to write a new cookbook. They have so many gorgeous foods on the show with everyone wanting the recipes. I’m looking for the Chocolate Manchester cookie recipe as well. I’ve never searched for a Hallmark movie recipe before! Has anyone contacted the Hallmark Channel? They’ve obviously created quite a curiosity since so many of us are googling chocolate Manchester cookies and not finding a recipe. But at least we found this blog, which I’ll now be following. Thanks, Debbie! Kindred spirits! That’s a good idea, Marsi. I’ll do that. But I’m glad you found my blog with the search! Paul, I wish I had the recipe. So many people are asking for it! If I ever find it, I’ll post here. In case Hallmark is watching, I’d love a copy of that Chocolate Manchester recipe too! Me too, Paul! I’m beginning to think I may have to develop the recipe myself since I can’t find it anywhere. Still searching! I really think I need to come up with my own version since I can’t seem to find the recipe for the one on the show. Im glad im not the only one looking for “chocolate Manchesters”. I was beginning to thinkmi was losing my mind!!!! Hallmark Channel- step it up- ball’s in your corner, tell us what she really nade and post the recipe please and save us from ourselves and thinking we’ve lost our hearing, our minds, or both! Hallmark has written cookbooks in the past (like Cedar Cove) so maybe there will be more to come. They certainly would be popular and hopefully include the Manchester cookie recipe! Lady’s mystery solved!!! Google Puff Pastry Pinwheels!!! Unicorns – Eat Cookies- Yay!!!!!!!! Thanks, Gina! I knew the cookies were pinwheels because they showed them briefly in the movie, but couldn’t tell in that short moment if they were cookie dough or puff pastry ones, or if the center was chocolate or jam. I guess people will have to make their favorite version! Either way is great.